^ Charles Petrie, "The Bicentenary of the Younger Pitt", Quarterly Review, 1959, Vol. 297, pp. 254 - 265. ^ Pitt, the Hon. William. 互联网档案馆的存檔，存档日期2012-06-03. ^ Spartacus Educational - William Pitt. Spartacus.schoolnet.co.uk. [2010-04-23]. （原始内容存档于2010-04-12）. ^ History - William Wilberforce (1759 - 1833). BBC. [2010-10-11]. ^ Britannica Online Encyclopedia - William Pitt, the Younger: Historical importance. Britannica.com. [2010-04-23]. 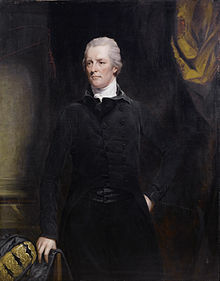 ^ 10 Downing Street - PMs in history - William Pitt 'The Younger' 1783-1801 and 1804-6. Number10.gov.uk. [2010-04-23]. （原始内容存档于2008-09-08）. ^ Jeremy Black. George III: America' s Last King. Yale University Press. 2006. ISBN 978-0300117325. ^ Paul Kelly, "British Politics, 1783-4: The Emergence and Triumph of the Younger Pitt's Administration", Bulletin of the Institute of Historical Research, Vol. 54, Issue 129, pp. 62 - 78. ^ Bruce E. Gronbeck, "Government's Stance in Crisis: A Case Study of Pitt the Younger", Western Speech, Fall 1970, Vol. 34, Issue 4, pp. 250 - 261. 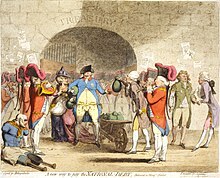 ^ British History - The 1798 Irish Rebellion. BBC. 2009-11-05 [2010-04-23]. ^ Stanhope's Life of the Rt Hon. William Pitt, Vol. IV, 1862, p. 369. ^ Marjie Bloy Ph.D. William Pitt the Younger (1759-1806). The Victorian Web. 4 January 2006 [2011-09-11]. ^ Cambridge Portraits from Lely to Hockney, Cambridge University Press, 1978, No. 86. ^ The Young Mr. Pitt. IMDb. [2012-06-15] （英语）. ^ The Madness of King George. IMDb. [2012-06-15] （英语）. ^ Amazing Grace. Amazinggracemovie.com. [2010-10-11]. ^ Dish and Dishonesty. IMDb. [2012-06-15]. ^ Pittwater's past. Pittwater Library - Pittwater.nsw.gov.au. [2010-10-11]. Ehrman, John. The Younger Pitt Vol. one: The Years of Acclaim. St Edmundsbury Press. 1984 . ISBN 0-09-465990-7. Ennis, Daniel. Enter the press-gang: naval impressment in eighteenth-century British literature. University of Delaware Press. 2002. ISBN 978-0-87413-755-2. Hague, William. William Pitt the Younger. HarperPerennial. 2005. ISBN 978-0-00-714720-5. Turner, Michael. Pitt the younger: a life. Continuum International Publishing Group. 2003. ISBN 978-1-85285-377-8. Duffy, Michael. The Younger Pitt (Profiles In Power). Longman. 2000. ISBN 978-0-582-05279-6. Ehrman, John. The Younger Pitt (3 volumes). Constable & Co. 1969–1996. Jarrett, Derek. Pitt the Younger. Weidenfeld and Nicolson. 1974. ASIN B002AMOXYK. Reilly, Robin. Pitt the Younger 1759–1806. Cassell Publishers. 1978. ASIN B001OOYKNE.